The grand strategies of war can be carefully planned—accounting for supply lines, maneuvering armies and armadas to apply maximum pressure, or painstakingly plotting a vital ambush. Still, even the greatest plans must alter—if not crumble—upon contact with the enemy. When the concussive blast of thermal detonators mixes with the hiss of blaster fire and brutal cries of melee combat, even veteran soldiers may struggle to remember orders and prioritize their objectives. 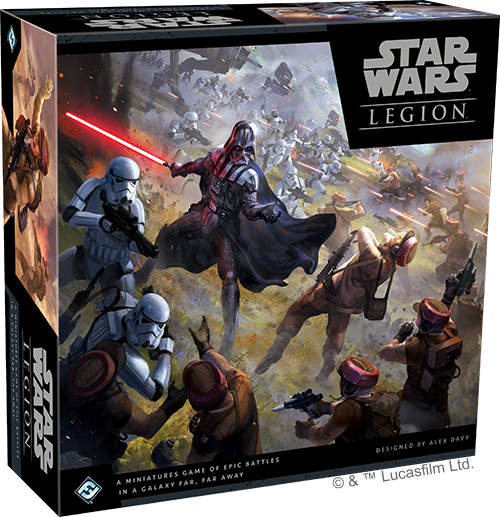 In your games of Star Wars™: Legion, you take on the gripping role of an infantry commander in the Star Wars universe, leading your troops and vehicles into battle on one of the countless unseen battlefields of the Galactic Civil War. Your forces are well trained and you know your objectives, but your army is not a machine that can respond instantaneously to every command. 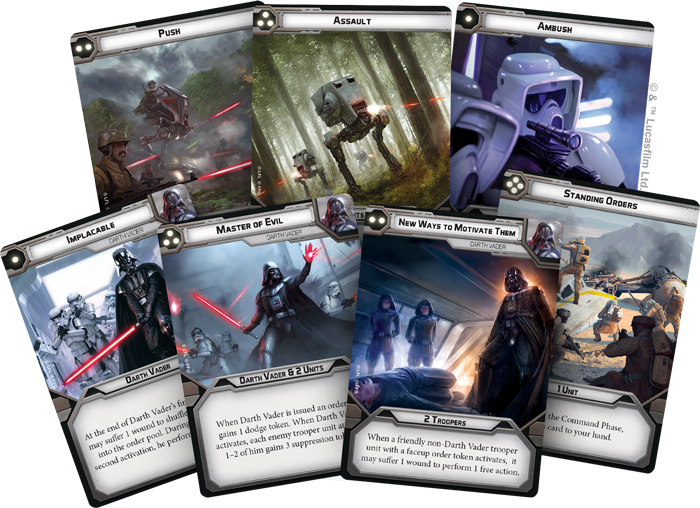 You’ll need to deliver orders to your troops to impose your will on the chaos of battle, and in today’s preview of Star Wars: Legion, we’ll look closer at command cards, ordering your troops, and how you’ll turn your greatest plans into action. Your battles in Star Wars: Legion unfold over the course of six rounds. During these six rounds, you’ll lead glorious infantry charges, send powerful vehicles stomping forward or zipping across the battlefield, and join iconic heroes and villains in lethal lightsaber duels. But just as every battle begins with a single order, every round of Star Wars: Legion begins with you and your opponent secretly selecting command cards. The command card that you choose comes from a hand of seven carefully chosen command cards that you’ll assemble before the game begins, as part of building your army. Both factions have access to a few neutral command cards, such as Push, but every commander in Star Wars: Legion also comes with three unique command cards, such as New Ways to Motivate Them or Return of the Jedi. These command cards represent a commander’s signature tactics or characteristic leadership, and with the special powers they carry, they’re almost always more powerful than the neutral command cards. You can’t use command cards over and over, however. After a command card is used, it’s discarded and can never be used again during this game! 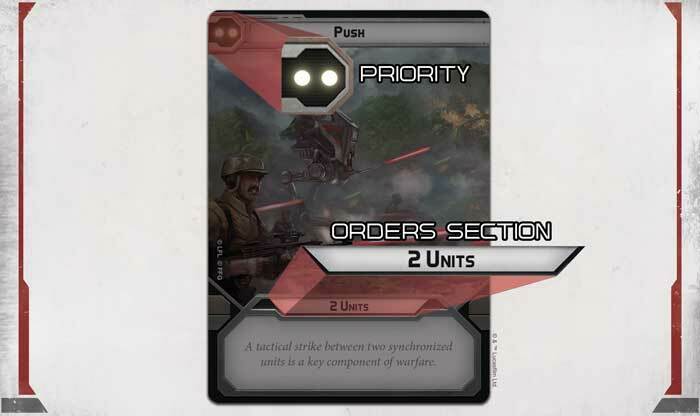 Whichever command card you choose at the beginning of the round, it sets the tone for your army’s maneuvers, because these command cards determine two vital pieces of information—which player has priority and how many units can receive your orders this round. In the upper-left corner of every command card, you will see a number of pips. If your command card has fewer pips than your opponent’s, you win priority—the chance to act first throughout the round! 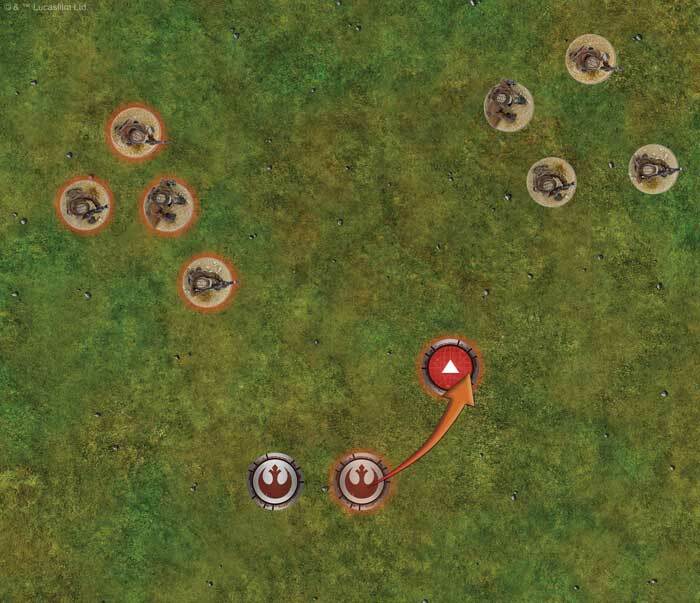 Activating first can be a powerful tactical advantage for you to harness—if you make the first attack, there’s a good chance you could pin an enemy down with blaster fire or inflict losses before that unit has a chance to activate. There’s always a balance that must be maintained, however. Cards like Ambush, with only a single pip for priority, give you a very good chance of going first. But in exchange, you can only give orders to a single unit. Considering the balance between priority and the number of orders you issue, and choosing the perfect command card for your strategy each round is just the first of the choices you’ll make during the command phase. If your command card determines the broad strategy that you plan to execute this round, the orders that you deliver to your troops are your primary way to impose your will on the unfolding battle. 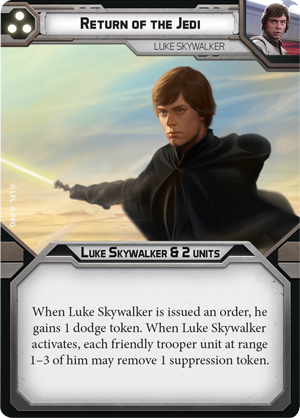 Your command card determines how many units you can order, but all of your orders ultimately originate from your commander—an iconic character like Luke Skywalker or Darth Vader. 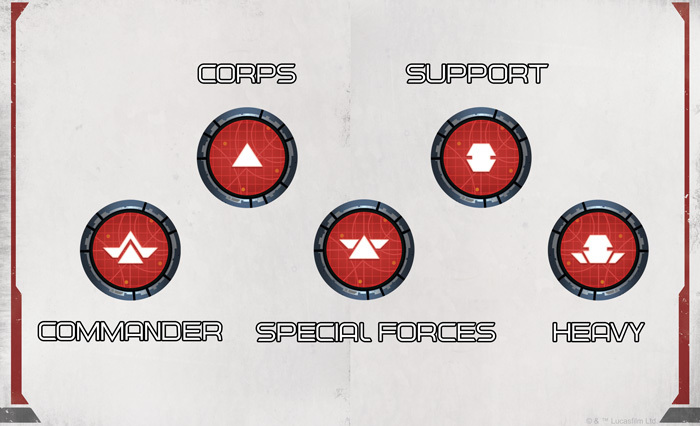 Every unit in a game of Star Wars: Legion has an order token displaying that unit’s rank on the battlefield—commander, corps, special forces, support, or heavy. (You can see examples of these order tokens above.) When issuing orders, you simply choose units within Range 3 of your commander and place those units’ order tokens next to them. Of course, you’re limited to the number of orders shown in the orders section of your command card. Once you’ve assigned your orders, all of your unused order tokens (corresponding to the unordered units in your army) are shuffled facedown or placed in a bag to randomize them. 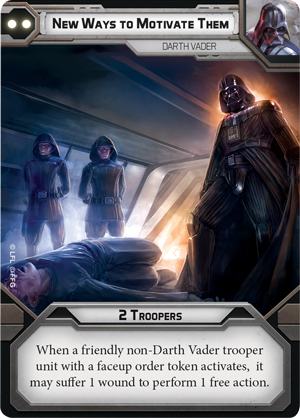 For instance, in the example above, you have played Push, which allows you to order any two units within range of your commander, Darth Vader. One unit of Stormtroopers is outside Darth Vader’s command radius, and cannot be ordered. You decide to issue orders to Darth Vader, placing a commander order token by him, and the second unit of Stormtroopers, placing a corps order token by them. The order tokens for the 74-Z Speeder Bikes and one unit of Stormtroopers are randomized by shuffling them facedown. Essentially, the orders that you issue cut through the chaos and uncertainty of battle to give you control over exactly when a unit will activate. You and your opponent will alternate activating units, and every time it’s your turn, you face a choice. 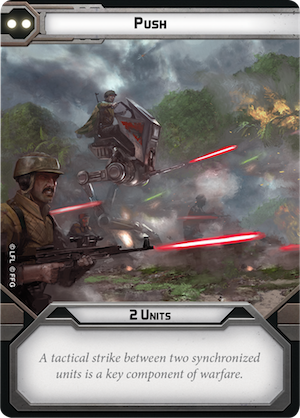 You could activate a unit that you issued orders to, sending your plans cascading into action as Rebel Troopers open fire or Darth Vader stalks unstoppably forward. Or, you may draw a random order token from your unused order tokens and activate any unit with the corresponding rank. 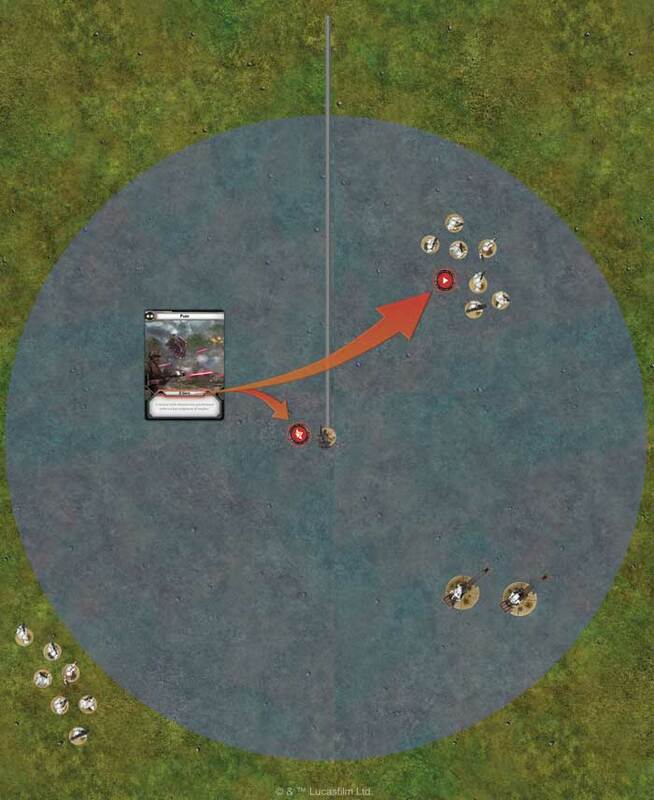 In the diagram above, the Rebel player randomly draws an order token showing the corps rank. 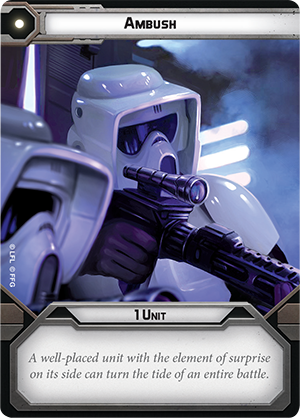 He can use this to activate any unit sharing that rank, such as one of the Rebel Trooper units shown above. Every unit in your army will activate during every round of the game—but if you don’t issue orders to a unit, you can’t predict exactly when that unit may activate. In one round, you may need your 74-Z Speeder Bikes to hold off until the last possible second, waiting on your wing before zipping forward to strafe enemy troopers. Or, perhaps Darth Vader and Luke Skywalker are caught in a deadly lightsaber battle, and you desperately need to strike first in the duel. By assigning orders to your units, you can be certain that they will activate exactly when you need them to—whether early or late. If a unit in your army did not receive orders from your commander, you must activate them when you draw their order token—and at certain times, that means adapting to the chaos of battle and activating a unit before you planned. 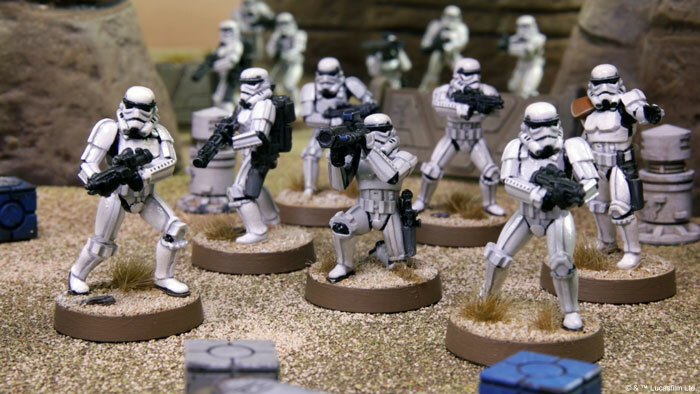 This is hardly the end for a seasoned commander, however—navigating the challenging command system of Star Wars: Legion and issuing your orders to just the right units are the momentous choices that define every game of Star Wars: Legion. The battle is raging around you as you fight for freedom or tyranny on another war-torn battlefield of the Galactic Civil War. 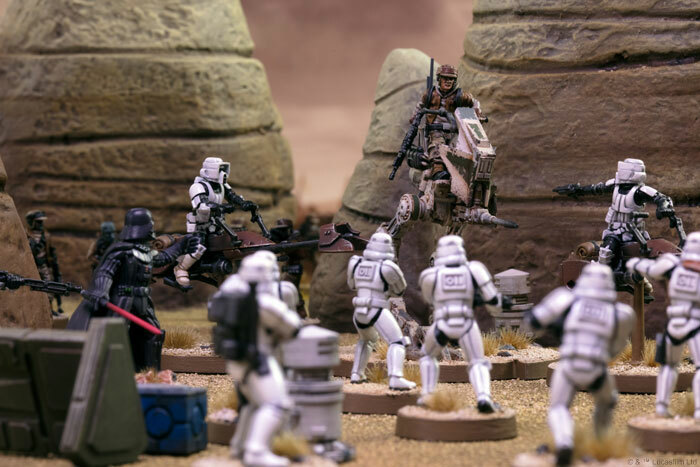 Join us for our next preview as we look at movement and combat, and pre-order Star Wars: Legion (SWL01) at your local retailer or on our website here!